Steam pipe explosion causes evacuations, street closures in Manhattan's Flatiron District. A massive steam pipe explosion caused the evacuation of a number of buildings and the closure of several streets in Manhattan's Flatiron District Thursday morning. At least five high pressure steam pipes exploded at approximately 6:40 AM Eastern Standard Time, the New York Post reported. 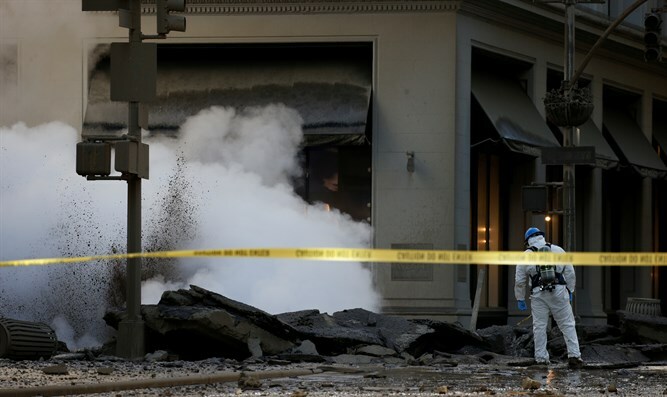 The explosion occurred on Fifth Avenue at 21st Street, creating a large hole in the middle of Fifth Avenue. Steam rose high into the air from the destroyed street, obscuring landmarks such as the Empire State Building. FDNY teams are at the scene attempting to contain the situation. No injuries were reported from the explosion. The Con Edison electrical company is investigating whether any asbestos or other contaminants were released into the air by the steam. Anyone who was exposed to the blast has been advised to shower and bag their clothes as a precautionary measure. The cause of the explosion remains unknown.